Sentencing in the case of former property mogul, Jason Rohde is on Wednesday expected to get underway in the High Court in Cape Town. He was convicted last year of murdering his wife, Susan at the Spier Wine Estate near Stellenbosch in July 2016. He was also convicted on a charge of obstructing justice. The 47 year- old mother of three was found in the bathroom of their hotel room in what the defence says was a suicide. The state is calling for a sentence exceeding the minimum sentence of 15 years on the murder charge. During sentencing procedures, the State argued that Rohde deceived his wife into thinking that he wanted to save their marriage. The State described his acts as ruthless and cold blooded. 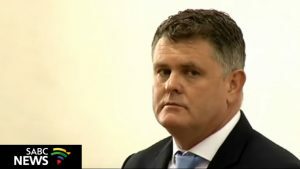 The defence however argued that Rohde’s action was a crime of passion that occurred in the heat of the moment. They are asking for a sentence that is less than the prescribed minimum sentence. The former property mogul’s mother, Brenda testified in mitigation of sentence saying her son never displayed any signs of aggression. Sentencing has been set down for two days. The post Rohde sentencing gets underway appeared first on SABC News – Breaking news, special reports, world, business, sport coverage of all South African current events. Africa's news leader..